Classic Grills Renaissance Round Bronze Grill Discounts Apply ! 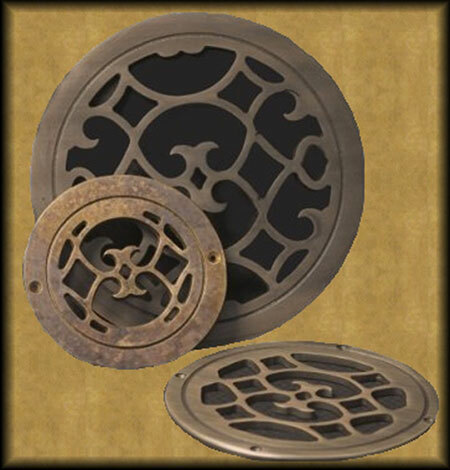 The round custom return grilles 1/4" thick bronze structure highlights the beautiful scroll pattern featured on the vintage vent cover. The custom return grille has 3 finish options to choose from which include: dark bronze, light bronze or antique burnished bronze finish. The circular vintage vent covers are constructed of solid bronze insuring the strength of your new custom return grilles. Screens are attached to all of the round vintage vent covers to keep smaller objects from falling through the grille and into your venting system. Measure your round vintage vent cover by the diameter across the circular vent hole in the wall or floor and not the size of the current grille. Overall faceplate dimensions of this return air grille cover are approximately 2" to 2 1/2" larger than the interior measurements. Example: A 10" round custom return grille will fit a circular vent opening that measures 10" across. Round custom return grilles are normally manufactured once an order has been placed. Special purchase and therefore the grilles are non-returnable and cannot be canceled once payment is received. Lead time is 7 to 9 weeks to be manufactured. Vintage vent covers are manufactured with screw holes for mounting. If you do not want screw holes on your grille place your request in the comments section of your order at checkout or place your order with us over the phone. Your custom return grilles will come with a screen attached to the back. Find rectangular vintage vent covers and rectangular vintage registers to match these round vintage vent covers. 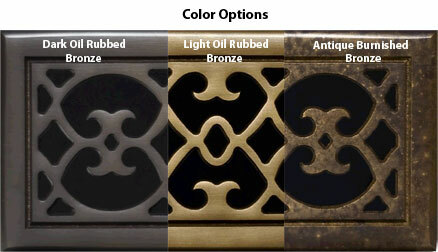 Looking for a different style of custom return grilles? We have a variety of other design in our custom grilles by Classic Grills. Hard to find circular vintage vent covers are a great update for your old and dirty circular grilles. Try them today!